During the discussions that took place during Omentielva Nelya regarding the encoding of Tolkien’s scripts, we touched on the subjects of which script is most popular. Of course, Tengwar is more popular than Cirth; if nothing else, the number of fonts is an indicator of this. There might be a bit over five Cirth fonts (I have not investigated this carefully), but what about the Tengwar? Just for the fun of it, I have attempted to count the number of Tengwar fonts in existence. I have listed vector fonts of any format and encoding model. (I regard TeX-fonts as vector fonts; however, low resolution bitmap fonts have been ignored.) Since I am here mostly interested in the number of unique designs, I have chosen to include also fonts that are not publicly available. The list is roughly cronological (at least in the beginning). The publications by Thorsten Renk use a unique font (partly based on Bradfield’s teng10). All in all, a pretty impressive number, I would say. i am the artist that “Updated/plagiarized” Tengwar Sindarinwa, only it happened the other way around… Michael S. Elliott plagiarised my work from the 1970s, before computers were in common use, only he didn’t get the spacing right, he didn’t include several characters, and others are so similar that they’re practically unreadable. if you’re going to post things like this, it would be nice if you got your information correct before doing it. Greetings Salamandir! I must admit I didn’t try to contact the creators behind the fonts in this list; all the information was compiled from the net in one afternoon, and I tried to reconstruct the chronology from what was available to me then. So I am very happy to be corrected! In that document, it says: “I had seen a number of fairly popular freeware fonts, particularly ‘Tengwar Gandalf’, which I considered to be severely lacking. … So … I started from scratch and, in 1995, successfully completed what I perceived to be the first fully functional Elvish typeface for use on a computer.” Here you explicitly acknowledges that Tengwar Gandalf precedes your font. How do you reconcile these conflicting statements? 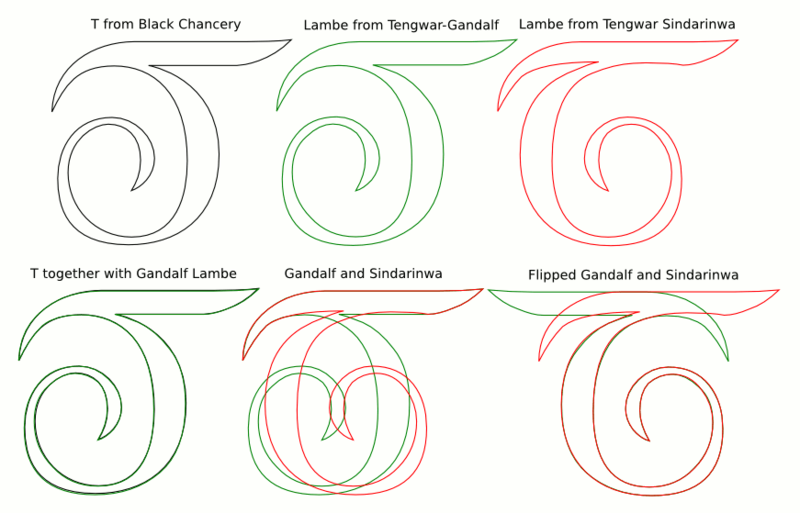 Furthermore, when comparing the individual glyphs of Tengwar Medium and those of Tengwar Gandalf, it is evident that many of them are exactly identical. This contradicts your stating that you “started from scratch”. If you would like, I would be very interested in getting some clarification concerning these matters. i originally started the artwork that became the font in the late 1970s, at the same time i started compiling the elvish dictionary. in the 1980s, when it became possible to transfer this artwork to the computer, i did so, first with MacPaint, and later using Fontographer. i completed what you found on http://www.hybridelephant.com in 1995, but apparently that was after the author of “Tengwar Gandalf” had seen an earlier version, and done a very poor copy-and-paste job. i suspect that the MacPaint version is the one he copied, but i’ve never actually been able to contact him to find out. Thank you for the quick answer! I will try to contact Michael S. Elliot, so that he can give his view of the story as well. By the way, now that I have the opportunity to ask: Do you know the reason why the letter Lambe is mirrored in Tengwar Gandalf? Was it mirrored already in your earlier version, and if so, how come? Or did Mr. Elliott flip it? actually that was one that i never figured out… the letter certainly was not mirrored when i made the original MacPaint “font” or any other time that i know of, so my guess is that mr. elliott must have flipped it for some unknown reason. I’m the Michael S. Elliott who created Tengwar-Gandalf. I used a program called “FontMonger” by a company called Ares software. I think I still have the original manual. I made the font independently on my Mac Plus around 1993? perhaps I’m not sure. I originally uploaded it to AOL and to the Hypermac archives. I’ll have to dig up the original font that I created… I don’t think I’ve even seen the Sindarinwa font before. If I had, I doubt that I would have gone to the trouble of creating the font in the first place. The only reason that I did it was that I couldn’t find a TrueType, vector LOTR font. So I just made my own. I’m sorry that you think that my version is a “poor copy-and-paste job.” I think YOUR font looks really cool. Mine might be poor, but it wasn’t copy-and-paste. I can’t just let this statement stand on its own. I downloaded the Sindarinwa font, and it’s clearly a near-copy of my own font. As your own readme states, you “started from scratch and, in 1995, successfully completed what I perceived to be the first fully functional Elvish typeface for use on a computer.” The ReadMe included with my font was dated August 17, 1993. Your “impression” is wrong. The only example that I had was the actual book inside cover from JRR Tolkien. I certainly have never seen a “sindarin dictionary” before 1993 or since then. Yours or anybody else’s. link in Johan’s post above. It looked identical to the JRR Tolkien book covers, which is very different from my font. Once I downloaded “yours,” it’s very clear to me that the Sindarinwa font is nearly a complete copy, with only a few modifications. I notice, however, that you were sharp enough to remove my “author” character from the font. For those of you with a Mac and the actual, Tengwar-Gandalf font installed, just type option-shift-period to see this character. You’ll need to bump the size up quite a bit to see it. If you have the V2.1 of the font, it’s option-shift-comma. Many of the characters (especially the numerals) were hand-drawn (actually mouse-drawn) using a calligraphic pen tip in SuperPaint, then converted to vectors. Those are certainly identical between my and “your” fonts. I went back to a CD of the Arizona Macintosh Users Group “BBS in a Box” archive from 1995. It contains a full copy of my VERSION 2.1 of the font, which included several modifications as well as the Type 1 and Type 3 postscript fonts. The files date from April 9, 1994. Regarding the lamba character, I corrected it in the version 2 iteration. So, for what it’s worth, this guy is clearly claiming credit for something he didn’t create. you can believe what you want, but i know what i created, and i have original artwork from the 1970s that is exactly the same as the artwork in my font. it’s possible that your use of SuperPaint and my use of MacPaint is a part of that, but i certainly didn’t plagiarise anything, as you pointed out, i didn’t put in the “author” character from your font… because it’s not your font! Enough now of this farce, Salamandir. From what I have seen, there is no reason what so ever for distrusting Mr. Elliott; indeed, the more I look into this, the only thing I do find is evidence for your dishonesty. To wit: You have repeatedly pushed the inception date of your font back in time. Conveniently, there are snapshots of your web site at different times in the Internet Archive. In the oldest version of your page, from 2002, you write that “this font was originally developed in 1994-1995”. For all that I know, this might actually be the truth, considering that Tengwar Gandalf was published in 1993. However, somewhere in the beginning of 2004, two digits have mysteriously changed, and now it is instead stated that “this font was originally developed in 1984-1985”. Did you one day realise that you actually had made the font one decennium earlier? This in itself is of course not proof of anything. Theoretically, it is possible that you simply had made a typo to begin with. Instead, let me quote, again, from the README.txt for Tengwar Medium/Sindarinwa, this time in extenso (and since you didn’t object when it was quoted before, I presume you at least don’t deny that you have written it): “I had seen [sic!] a number of fairly popular freeware fonts, particularly ‘Tengwar Gandalf’ [sic! ], which I considered to be severely lacking. They didn’t represent all of the different Sindarian [sic!] letterforms, didn’t handle ligatures at all, and looked lousy when printed from a relatively high resolution printer. So [sic! ], calling on my skills as a graphic artist, calligrapher and typographer, I started [sic!] from scratch [sic!] and, in 1995 [sic, the same date as originally stated on your web page! ], successfully completed what I perceived to be the first fully functional Elvish typeface for use on a computer.” It is very telling that you do not comment on this quote, because, honestly, there is no possibility that this can be interpreted in any other way than that you first saw Tengwar-Gandalf, and then decided to design a better font. These are certainly not the words of one who has discovered that he is the victim of plagiarism! Rather, they are the words of one who wants to take more credit than he deserves: why else would you insist on the demonstrably false “from scratch”? As you yourself acknowledge, many of the glyphs in the fonts are virtually identical. Finally, regarding the mirrored Lambe, I admit it was a trick question. Your answer was: “actually that was one that i never figured out… the letter certainly was not mirrored when i made the original MacPaint ‘font’ or any other time that i know of, so my guess is that mr. elliott must have flipped it for some unknown reason.” As a matter of fact, the Lambe of Tengwar-Gandalf was in all likelihood copied from the capital T in the public domain font “Black Chancery” and, as this picture shows, all three glyphs are without any doubt related to each other. Also, Black Chancery pre-dates Tengwar-Gandalf by several years. How, then, is this to be explained? Are we to believe that the author of Black Chancery saw your obscure font in the mid 1980’s, copied your Lambe, and flipped the bottom part? And that Michael in 1993 released your font under his own name, but not before he for some reason bothered to discard your correct Lambe and replace it with the flipped version from Black Chancery? How interesting…I remember seeing the Black Chancery font before. Looking at the character, you’re right–I don’t recall copying it, but they are identical. I wonder if I used black chancery as a template “container” for the rest of the design? I honestly don’t remember, but I definitely had heard of Black Chancery before today. The “y” character is also very similar to my font, especially in the v 1.1 of the font. 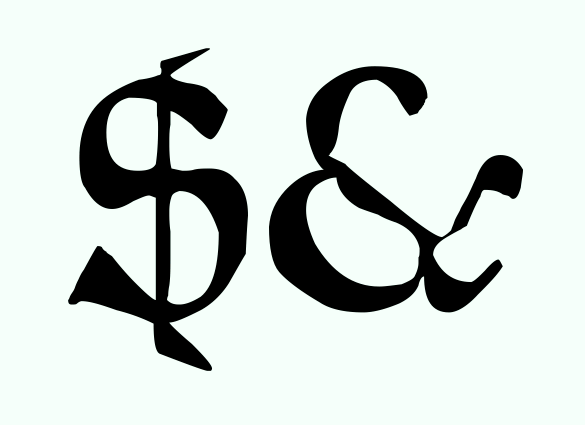 Also look at the Ampersand “&” character…they’re identical. I think it’s pretty clear that I used Black Chancery as the template somehow. I do recall hand-drawing the characters, especially the numerals. But I think it’s pretty clear that I used the black chancery font as the base work, probably using the actual TTF font file as my building block. I’ve been poking through the Black Chancery font some more. It’s weird…in my font, the Option-Y character ( “¥”) comes up, and I KNOW that I never would have made that character. Yet it’s not present in the Black Chancery font. 17 years later, I have no idea what “template” I was using. Ah, yes, the tengwa Rómen is indeed also from Black Chancery, with a slight modification. But I think those are the only similarities between the two fonts. I am unsure what you refer to when you mention “&” and “¥”: surely the ampersand in Black Chancery looks nothing like that in Tengwar-Gandalf? Or are we looking at different versions of the fonts? Similarly, none of the Tengwar-Gandalf versions I have access to contains a Yen sign. Maybe the program you tested in substitutes another font whenever there is a character missing in the current font? You’re right again. I think my program (TextEdit) DOES substitute a generic Roman glyph for any glyph that is not included in the font. (For the other readers, they look like this.) They are somewhat rough in the contours, but I agree that their style is not entirely like that of the other signs, such as the numerals. I can’t say that I recognise them though. yeah, i’m a real character all right. i had the temerity to remove a commercial font, of which i am the author, from a place where you could get copies of it for free. Thanks for the notice! I have updated the relevant posts to reflect this. The font file, including the documentation, is still available from http://tengwar.art.pl/tengwar/fonty.php however. Actually, you did exactly what would be expected. I’ve loved reading through your blogs. Very entertaining. An egomaniac as well as a liar. Great combination. Greifswalder Tengwar is fun. It mimicks connected handwriting. TengwarOptime comes in two styles, TengwarOptime and TengwarOptimeDiagon. When I install both styles, my system thinks they both have the same name TengwarOptimeDiagon (from what I can tell they clearly don’t) and will only display TengwarOptime. The fonts use Dan Smiths encoding. That is so cool, thanks for the notice! I also see that this Peter Wiegel has created yet another font I didn’t know about before: Elbic/Elfic Caslon. I have updated the post with links to these new fonts. There is a second font by Rebecca Bettencourt (the author of the Constructium font): Fairfax (scroll down). It has the look of a monospaced 6×12 pixel bitmap font, and it currently still uses the mapping of Everson’s original ConScript Unicode Registry, but she’s written me she’s going to update it so it will have the same mapping we’re using (and the same for Constructium, too). Thanks for the notice. I remember that I had seen Fairfax before; however, I chose to not include low resolution bitmap fonts; there is another bitmap font, Lothlorien, which likewise did not include. Maybe I should have, but at the time I was thinking that glyphs only a few pixels should not be regarded as exceeding a sufficient threshold of originality to be counted amongst vector fonts. I love YOUR font (yes, I went there). But your read-me states that to get the double letter, such as “LL”, to use SHIFT+OPTION+LETTER…I have a PC, and from what I can find, the option key on a PC is ALT, yet it just dings its annoying little “can’t do that” noise when I attempt to try that. I have no intentions of buying a mac just so i can use this awesome font…is there some sort of update or coding that can be done to make this font PC-usable? The following explanation was provided by the support personnel at Ares Software, the makers of FontMonger 1.5.8, which was used to create this font. “Under Windows, there are 2 ways to access characters that aren’t accessible from the normal and shifted keys. 1. If you know the ANSI character number, you can enter the character by holding down the ALT key, then typing 0 (zero) followed by the character number *on the numeric keypad*. When you release the ALT key, the number you typed is translated into a character and then processed normally. Be careful, though. The character numbers in Windows ANSI aren’t the same as the Mac character numbers. 2. You can go to the International control panel and select a keyboard other than the standard US keyboard. Most other keyboards have additional key combinations (usually Ctrl+Alt+some key) to get at more characters. A good one to play around with is the US International keyboard. Besides the Ctrl+Alt combinations, it also has several dead keys (they work like Option-e on the Mac). Windows users might find these alarming, though, since most of them haven’t encountered dead keys before. Also, they’re in inconvenient places, like the ‘ (single quote) key. Sorry for the Anti-Windows stuff. It was the early ’90s. What can I say? Hmm. I got the font from dafont.com….I do not know if this was even the updated version or whatever…if it is NOT the most “recent”, where can I find the most recent? But it doesn’t make it doubled…for instance words like “bell” (in English) or Elladan (the only Sindarin-ish word I could think of off the top of my head with a double L) I had 2 of the letter side by side…am I just confused, or does the font coding not provide the doubling? (Which, when I write by hand, is generally a flag beneath of over the doubled letter, depending). Sorry if I am being a nuisance…I just really like to make things look right when I write. On the regular “U.S.” keyboard layout, Option+Shift+L will produce the character “Ò”. In Tengwar Gandalf, this really produces some kind of tehta and lambe combination, a combination that would probably read /nl/. This may seem new and unfamiliar at first, but in fact, this is the normal way to write different scripts on the computer: to write greek, you change the keyboard layout to output greek characters, etc. Good luck! If you encounter difficulties, ask again, and I will try to guide you through them. It is rather rough, based on handwriting (maybe somewhat calligraphic). There is no download.